Augusta served as the capital of Georgia from 1785 until 1795 when the seat of government was moved to the new capital, Louisville. 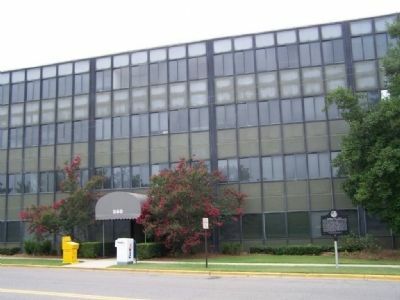 The Georgia General Assembly met at this site in a two-story building on the corner of Elbert (Fourth) and Bay Streets. The building was known as both the State House and Government House and was adjacent to the Academy of Richmond County. 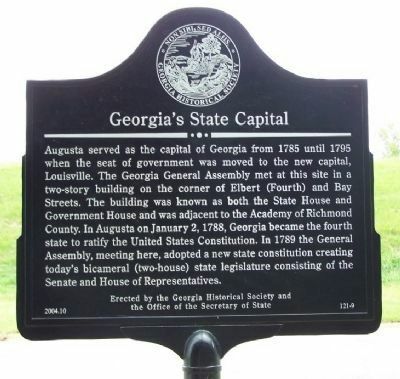 In Augusta on January 2, 1788, Georgia became the fourth state to ratify the United States Constitution. In 1789 the General Assembly, meeting here, adopted a new state constitution creating today's bicameral (two-house) state legislature consisting of the Senate and House of Representatives. Location. 33° 28.426′ N, 81° 57.309′ W. Marker is in Augusta, Georgia, in Richmond County. Marker is on Bay St near Elbert St.
. Touch for map. At the Savannah River. Marker is in this post office area: Augusta GA 30901, United States of America. Touch for directions. Other nearby markers. At least 8 other markers are within walking distance of this marker. The First Academy of Richmond County (within shouting distance of this marker); Jefferson Davis Bridge (approx. 0.2 miles away); The “Haunted” Pillar of the Lower Market (approx. 0.2 miles away); Birthplace of the Augusta Chronicle (approx. ¼ mile away); Veterans of All Wars (approx. ¼ mile away); St. James United Methodist Church (approx. 0.3 miles away); Bicentennial Augusta, Ga (approx. 0.3 miles away); Troop K Georgia Cavalry (approx. 0.3 miles away). Touch for a list and map of all markers in Augusta. More. Search the internet for Georgia's State Capital. Credits. This page was last revised on June 16, 2016. This page originally submitted on July 31, 2008, by Mike Stroud of Bluffton, South Carolina. This page has been viewed 1,298 times since then and 10 times this year. Photos: 1, 2. submitted on July 31, 2008, by Mike Stroud of Bluffton, South Carolina. • Kevin W. was the editor who published this page.